Karu T.I. Mechanisms of low-power laser light ac­tion on cellular level. Lasers in Medicine and Den­tistry. Ed. by Z.Simunovic. Rijeka. Vitgraph. 2000. pp. 97-125. T. Oshiro, R.G. Calderhead. Low Level Laser Therapy - A practical Introduction. 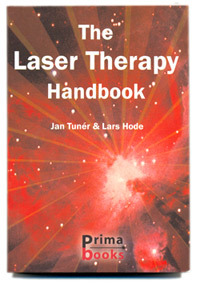 Baxter G. D. Therapeutic Lasers Theory & Practice, Leenergie douce face e la douleur, Coche P.
DOM & David Rindge DOM, RN. Manual, Sweden. Almeida-Lopes L. Human gingival fibroblast proliferation enhanced by LLLT. Analysis in vitro of the cellular proliferation of human gingival fibroblasts with low level laser. Dissertation at Universidade do Vale do Para�ba, S�o Paulo, Brazil. 1999. Lubart R, Friedman H, and Lavie R. Photobiostimulation as a function of differ­ent wavelengths. bone regeneration. 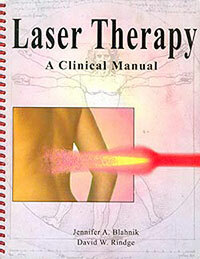 The Journal of Laser Therapy. Vol 12. 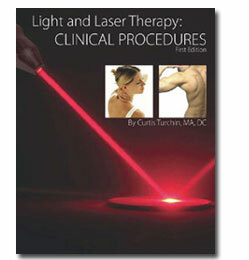 World Association of Laser Therapy. 2000. Karu T. et al. Changes in absorbance on monolayer of living cells induced by laser irradiation. IEEE Journal of Selected Topics in Quantum Electronics. IEEE Lasers and Electro-Optical Society. December 2001. 7(6): 982. Congress of European Medical Laser Association, Dubrovnik, Croatia, June 2000. Tam G. Action of 904 nm diode laser in orthope­dics and traumatology. Laser Center, Tolmezzo, Italy. Meridian Co, Ltd. Website: http://www.meridian.co.kr/ product1_8.htm. Last visited 10/27/03. Bjordal JM, and Couppe C. What is optimal dose, power density and timing for low level laser therapy in tendon injuries? A review of in vitro and in vivo trials. Department of Physiotherapy Science, University of Bergen, Norway. Abstract from the 7th International Congress of European Medical Laser Association, Dubrovnik, Croatia, June 2000. Kubota J. Laser and sports medicine in plastic and reconstructive surgery. Department of Plastic and Reconstructive Surgery, Kyorin University School of Medicine, Tokyo, Japan. Abstract from II Congress of the Internat. Assn for Laser and Sports Medicine, Rosario, Argentina, March 10-12, 2000. Lievens P and Van der Veen PH. Wound healing process: influence of LLLT on the proliferation of fi­broblasts and on the lymphatic regeneration. Depart­ment of Rehabilitation research, Vrije University, Brus­sels, Belgium. Abstract from the 7th International Congress of European Medical Laser Association, Dubrovnik, Croatia, June 2000. Ohno T. Pain suppressive effect of low power laser irradiation. A quantitative analysis of substance P in the rat spinal dorsal root ganglion. J Nippon Med Sch. 1997. 64 (5):395-400. Tsuchiya K et al. Diode laser irradiation selectively diminishes slow component of axonal volleys to dor­sal roots from the saphenous nerve. Neuroscience Letters. 1993. 161:65-68. Rochkind S, et al. Laser therapy as a new modali­ty in the treatment of incomplete peripheral nerve in-juries: Prospective Clinical Double-Blind Placebo-Controlled Randomized Study. Department of Neuro­surgery, Rehabilitation and Physiotherapy, Tel Aviv Sourasky Medical Center, Israel. Abstract from the 7th International Congress of European Medical Laser Association, Dubrovnik, Croatia, June 2000. Byrnes KR, et al. Cellular invasion following spinal cord lesion and low power laser irradiation. Lasers Surg Med. 2002. S14:11. Rochkind S, Shahar A, and Nevo Z. An innovative approach to induce regeneration and the repair of spinal cord injury. Laser Therapy. 1997; 9 (4): 151. Schindler A, et al. Increased dermal neovascular­ization after low dose laser therapy. 2nd Congress, World Association for Laser Therapy. Kansas City. 1998. Almeida-Lopes L, et al. Comparison of the low level laser therapy effects on cultured human gingival fibroblasts proliferation using different irradiance and same fluence. Lasers in Surgery and Medicine. 2001. 29(2):179-184. Samoilova KA, et al. Enhancement of the blood growth promoting activity after exposure of volun­teers to visible and infrared polarized light. Part I: stimulation of human keratinocyte proliferation in vitro. Advance Article of 2004 Photochemical & Pho­tobiological Sciences. Published on the web at http://www.rsc.org/is/journals/current/PPS/ppAd?vArts.htm. Sept 1, 2003. Barber A, et al. Advances in laser therapy for bone repair. The Journal of Laser Therapy. Vol.13. World Association of Laser Therapy. 2000. Antonio L, et al. Biomodulatory effects of LLLT on bone regeneration. The Journal of Laser Therapy. Vol. 13. World Association of Laser Therapy. 2000. Shefer G, et al. Low energy laser irradiation pro-motes the survival and cell cycle entry of skeletal muscle satellite cells. Journal of Cell Science. 2002. 115: 1461-1469. Enwemeka CS and Reddy GK. The biological ef­fects of laser therapy and other modalities on con­nective tissue repair processes. The Journal of Laser Therapy. Vol. 12. World Association of Laser Therapy. 2000. Reddy GK, Stehno-Bittel L, and Enwemeka CS. Laser photo stimulation accelerates wound healing in diabetic rats. Wound Repair and Regeneration. 2001. 9:248-255. Stadler I, et al. 830 nm irradiation increases the wound tensile strength in diabetic murine model. Lasers in Surgery and Medicine. 2001. 28 (3):220-226. Parizotto N, et al. Structural analysis of colagen fibrils after He-Ne laser photo stimulation. 2nd Con­gress, World Association for Laser Therapy. Kansas City. 1998..